What casino sites have 3D pokies? What was once regarded a futuristic dream, up there with hover boards and robotic servants, three-dimensional gaming has become a genuine reality, making its way into homes as online gaming becomes further widespread. Pokies have certainly not been neglected – this article will run you through the latest developments in 3D pokies gaming and show you were to play them. The rise in popularity of virtual gambling means casino software is often the first to enjoy the fruits of innovative technology, with 3D casino games slowly making their way on to the market over the past few years. There is now a good selection of 3D pokies available online, with promising advances on the horizon. 3D pokies are virtual slot machines that go above and beyond the impressive visual quality we’ve come to know and love from such ground-breaking video pokies as Jurassic Park, Spiñata Grande, Castle Builder and The Invisible Man. These interactive 3D games take things to the next level, with three-dimensional visual displays adding a stimulating aesthetic that makes the player feel more absorbed in the game than ever before. 3D pokies add an extra level of excitement and visual stimulation to online gameplay and make real money betting even more enthralling. 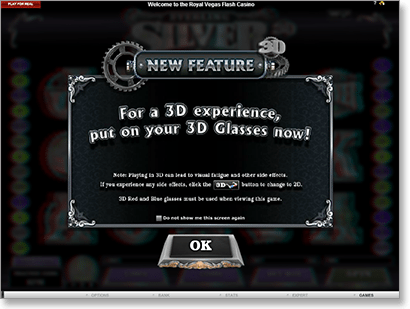 3D pokies can be accessed using desktop computers, smartphones, laptops and tablets. To the gaming world, there are some debates over what constitutes genuine 3D gaming. To some, the true effect of 3D can only be obtained using special stereoscopic glasses, like the ones used in cinemas for the 3D film experience, or the old faithful red and blue cellophane lensed specs. To others, a game can be considered 3D if it uses a high level of animation in order to produce a three-dimensional effect, without the need for any visual apparatus, like pokies where the reels seem to come to life when symbols pop out. …. Plus many more. Each game is vibrant, fun and adds to the experience with animated intro scenes and innovative bonus features. BetSoft’s 3D pokies catalogue is an exciting example of where online pokies are heading, and provide a great platform for newbies to virtual slots. BetSoft games can be found at a majority of the leading multi-provider online casinos, including our recommended venues like G’day Casino, Slots Million and Guts Casino. If you’ve ever been shuffling through an online slots catalogue and come across Sterling Silver, you may have instantly discarded it due to what seems to be fuzzy graphics. But no, the game only looks that way because it is in fact a stereoscopic 3D game, requiring 3D glasses to view properly. 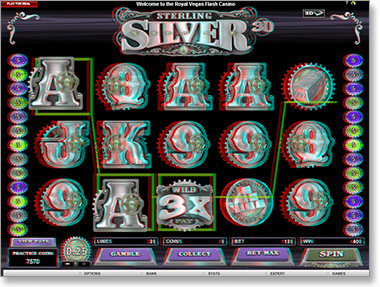 Sterling Silver is the first online pokies game that come in ‘true’ 3D, providing a cinematic 3D effect when using stereoscopic lenses. Although highly innovative, this game never really blew up in popularity, perhaps due to the effort involved in obtaining glasses to view it properly. Sterling Silver can be switched to play in 2D mode, but when doing so it’s an unremarkable, standard five reel 25 pay line pokies game with nothing exceptional to rave about. The game does come with a tutorial about how to make your own 3D glasses if you don’t have access to a pair. It’s totally worth trying out just to get a taste of the potential things to come for 3D pokies. You can play Sterling Silver at several of our favourite casinos, including Royal Vegas Casino. Many of our recommended casinos offer a wide selection of BetSoft’s 3D pokies, along with Microgaming powered sites offering Sterling Silver 3D slots. These sites each have their fingers on the pulse when it comes to new games and innovative software, so keen punters can keep an eye out at any of these venues for further 3D pokies developments as they unveil. There are also some great bonus offers available for online pokies. As the first 3D slot game only hit the market a couple of years ago, 3D pokies technology is still in its infancy, but as online gaming expands at the blink of an eye, we can only speculate that there is some game-changing technology in the making. Wearable devices like Google Glass and iGlass present the possibility of 3D pokies becoming more interactive than we ever thought possible, with reels that have the potential to spring to life before your very eyes without the use of a screen. Whatever the future holds, online players will be the first to bask in the glory, as the technology available via the Internet holds much more room for innovation than the machines you find within the wall of a pokies lounge.